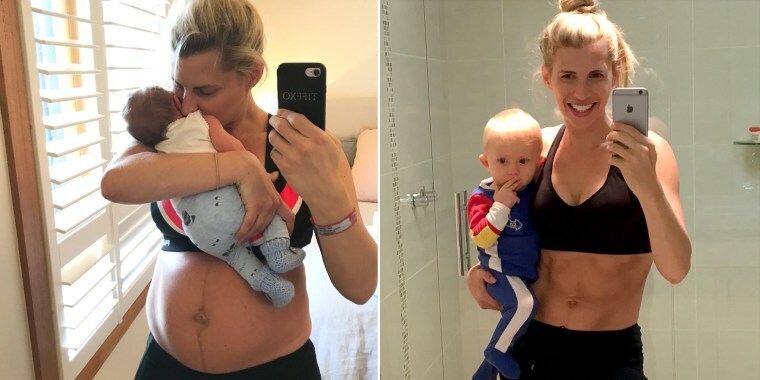 This diet philosophy helped one fitness trainer regulate her hunger and lose the baby weight. It’s a typical weight-loss tragedy: You ate healthy for a week, then you devoured a donut at the office party and now you’re mourning your diet. “The 3-hour rule is a rule I set in place to combat the all-or-nothing-diet mindset,” Hall tells NBC News. The 3-hour rule works because it treats each meal as a new event, she says. So instead of dwelling on the donut, work on resetting your outlook. “Just say, I’m human, I’ve slipped up, but in three hours time — and set your alarm — there’s a fresh day, fresh start,” Hall says. The 3-hour rule works because it treats each meal as a new event. The trainer says the 3-hour rule gave her the flexibility she needed to lose 65 pounds after giving birth to her son. “I wanted to do it with self love and I didn’t want to punish myself and hate it, so I employed the 3-hour rule and I lost [65 lbs] in eight months slowly, gently, healthily,” she recalls. Hall says her experience as a trainer on The Biggest Loser Australia showed her how people often battle emotional eating. A big part of learning to eat healthy means incorporating high-calorie foods into your diet without overdoing it, she says. But before you reach for that donut or pizza slice, ask yourself: “Am I hungry or am I hurting?” It’s a simple question Hall says can help you assess how your mood might be affecting your hunger. “Just asking yourself that question can short circuit the behavior,” she says. If your answer is ‘I think I’m hurting,” then she advises taking steps to heal the pain without food. Write down your top 10 ways to give yourself self care, says Hall. The list should include activities that will help distract you from your cravings. For some people, that might be painting or knitting, for others, it might mean playing sports or exercising, she says. Hall says she distracts herself from food by playing the piano or relaxing in an epsom salt bath. “I feel better and it stops pantry raiding, and it helps control your weight,” says Hall. According to the fitness trainer, the 3-hour rule will help you regulate your hunger so you are less likely to binge. The active personal trainer followed a general rule of thumb: eat three balanced meals and three smaller healthy snacks throughout the day. Proteins and healthy fats are essential, Hall says, because they keep you feeling full. “Every three hours, have something to sustain your blood-sugar levels and your brain to make sure you are performing at a high level, whether that’s academic or corporate or physical,” she says. To keep your progress on track, the instructor suggests putting a chart on your fridge. Every time you have a healthy meal, put a gold star sticker on the chart. When you indulge in a high-calorie snack, she says, add a different sticker — like a smiley face, for example. Hall says it will show you that those minor binges aren’t that big a deal after all. “Two little slip ups over seven days — it’s not going to make a difference, and you start to have a perspective of a bigger picture,” Hall says. Every three hours, reset and reassess. If you indulged in something you regret, instead of dwelling on it, focus on your goals. In three hours, when you eat again, reset and restart your mindset. Before snacking, ask yourself ‘Am I hungry or am I hurting?.' Before you reach for that high calorie snack, ask yourself if you're actually hungry, or if your mood is causing cravings. This is a good way to asses how your emotions are affecting your hunger. Eat three balanced meals and some healthy snacks each day. The 3-hour rule will help you regulate your hunger so you are less likely to binge. If you are active, a general rule of thumb is to eat three balanced meals and some smaller, healthy snacks throughout the day. Proteins and healthy fats are essential to keeping you feeling full. Track your progress to stay motivated. Put a chart on your fridge. Every time you eat something healthy, add a gold star sticker. On the rarer occasions you eat something high in calories, add a different sticker, like a smiley face. This will show you in a visual way how those minor slip ups really don’t make a dent in your progress.